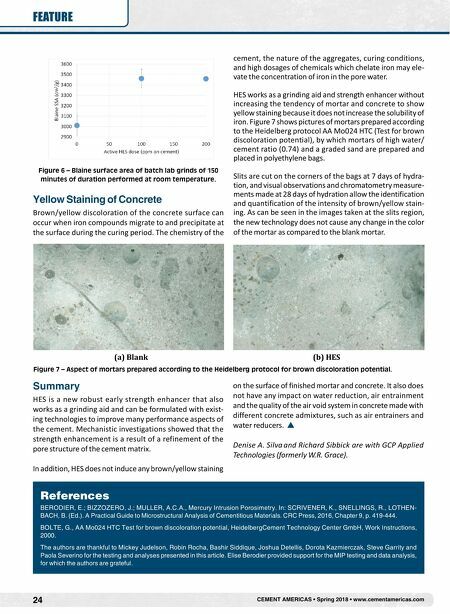 24 CEMENT AMERICAS • Spring 2018 • www.cementamericas.com FEATURE (a) Blank (b) HES Figure 7 – Aspect of mortars prepared according to the Heidelberg protocol for brown discoloration potential. Summary HES is a new robust early strength enhancer that also works as a grinding aid and can be formulated with exist- ing technologies to improve many performance aspects of the cement. Mechanistic investigations showed that the strength enhancement is a result of a refinement of the pore structure of the cement matrix. In addition, HES does not induce any brown/yellow staining on the surface of finished mortar and concrete. It also does not have any impact on water reduction, air entrainment and the quality of the air void system in concrete made with different concrete admixtures, such as air entrainers and water reducers. Denise A. Silva and Richard Sibbick are with GCP Applied Technologies (formerly W.R. Grace). Figure 6 – Blaine surface area of batch lab grinds of 150 minutes of duration performed at room temperature. Yellow Staining of Concrete Brown/yellow discoloration of the concrete surface can occur when iron compounds migrate to and precipitate at the surface during the curing period. The chemistry of the cement, the nature of the aggregates, curing conditions, and high dosages of chemicals which chelate iron may ele- vate the concentration of iron in the pore water. HES works as a grinding aid and strength enhancer without increasing the tendency of mortar and concrete to show yellow staining because it does not increase the solubility of iron. Figure 7 shows pictures of mortars prepared according to the Heidelberg protocol AA Mo024 HTC (Test for brown discoloration potential), by which mortars of high water/ cement ratio (0.74) and a graded sand are prepared and placed in polyethylene bags. Slits are cut on the corners of the bags at 7 days of hydra- tion, and visual observations and chromatometry measure- ments made at 28 days of hydration allow the identification and quantification of the intensity of brown/yellow stain- ing. As can be seen in the images taken at the slits region, the new technology does not cause any change in the color of the mortar as compared to the blank mortar. References BERODIER, E.; BIZZOZERO, J.; MULLER, A.C.A., Mercury Intrusion Porosimetry. In: SCRIVENER, K., SNELLINGS, R., LOTHEN- BACH, B. (Ed.). A Practical Guide to Microstructural Analysis of Cementitious Materials. CRC Press, 2016, Chapter 9, p. 419-444. BOLTE, G., AA Mo024 HTC Test for brown discoloration potential, HeidelbergCement Technology Center GmbH, Work Instructions, 2000. 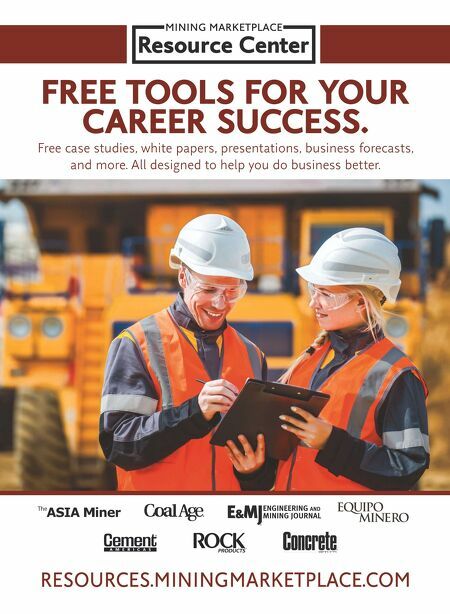 The authors are thankful to Mickey Judelson, Robin Rocha, Bashir Siddique, Joshua Detellis, Dorota Kazmierczak, Steve Garrity and Paola Severino for the testing and analyses presented in this article. Elise Berodier provided support for the MIP testing and data analysis, for which the authors are grateful.